Well, I finally took a minute to sew Matthew's pants to match Daddy's. I didn't have a pattern so I just started cutting. They actually turned out pretty nice. He is super duper cute in them. 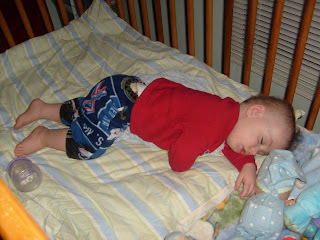 But since he is always moving and it's hard to get a picture, I had to wait until he fell asleep. And this was Gracie's latest project. 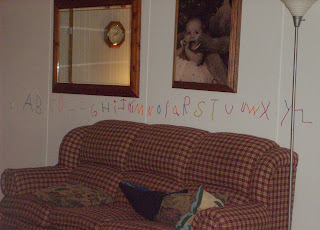 Making my living room wall into an ABC board using Bendaroos. When I saw the first ABC pic, I thought she had wrote on the wall. I thought "oh no!!!" The benderoos look cool. LOL Yea, it kind of looked like that. :) She tried that a few years back...though not on such a grand scale. The Bendaroos are a bit expensive. Around $20. (I did not buy them - Grandma did that :)) They are basically a really strong string covered in wax. She looooves them. I need sleep but I'm blogging instead!